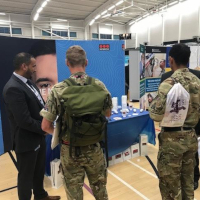 Securitas UK was proud to attend the British Forces Resettlement Services (BFRS) careers fair in Aldershot, on Thursday 24th May. Over 60 companies were in attendance on the day, including Royal Mail, Fujitsu, XPO Logistics and DHL. BFRS is a Community Interest Company (CIC), a social enterprise created in 2009 to support the armed forces community. They host career fairs across the country, to ensure companies are aware of the benefits of employing from this community. In February 2018, Securitas signed The Armed Forces Covenant, as a show of support for service leavers looking for a new career pathway. Attendance at the BRFS careers fair was part of Securitas’ ongoing commitment to the Covenant. Securitas employs a large number of service leavers in a variety of front line and management roles. Andy Hill, Area Director at Securitas, commented: “Securitas recognises the value of serving personnel, reservists, veterans and military families in business. I joined Securitas 8 years ago, after 19 years of service with the armed forces, and I am now the Area Director for Lancashire, Cheshire, Yorkshire & Humber. To find out more about the BFRS visit their website and to see current Securitas vacancies visit the Securitas website.